Ketut Liyer, The Healer Of Eat, Pray and Love in Bali is a Celebrity! The 95 year old healer from Ubud became a celebrity when author Elizabeth Gilbert penned about her friendship with this man in her book. More than seven million copies of this novel have been sold all over the world and a movie starring Julia Roberts was released. He is visited by more than 50 people per day at his remote home. These people come to him for palm readings and health consultations. One courageous traveller, Jennider, shared her experiences with the healer himself! It is rather complicated to find Ketut in Bali by yourself. "To find him on your own is hard, because the city, where he lives, is located quite far from the capital. The good thing is, you can hire a car to take you there," says Jennifer, who travelled all the way there to meet him. Before the book and the movie, Ketut was popular only in Bali, but now more and more tourists come to meet him and that creates quite long queues. "The queue can take 6 hours easily! I got lucky the third time, because on the first the line was too long and on the second time when I took the number I thought it would take 4-6 hours. So I went back to the hotel, but when I called 3 hours later, it appeared that I had missed my turn. Luckily, when I returned for the third time, Ketut was willing to see me. But you never know how long his reading will take, because sometimes if he feels like it he goes and has a nap! I also heard that there are people he refuses to see!" says Jennifer. Ketut's reading is based on a person's appearance and he charges 20 euros per session. "Ketut told me amazing things just by looking at me and taking my face as a guideline. Of course he looked at my neck, knees and hands, especially my left palm. Based on this he told me information about my future, age, career, number of children and also about marriage! The session costed 20 euros and to some people it may seem not that big amount, but considering the fact that an average man on Bali earns 50 euros per month, Ketut's sessions are pretty expensive," tells Jennifer. After the reading Ketut gave Jennifer his card and said to keep in touch! "The biggest surprise to me was that all the scenes from the movie are the same you see there, when you meet him. Everything really exists!" Jennifer says the best time to travel to Bali is between April and November, because right now its the rain season. "I went there during the rain season, but to the ones who wish to sunbathe and get tanned, I suggest to go there starting from April. There are so many places to visit - volcanos, rice fields, temples and different beaches. 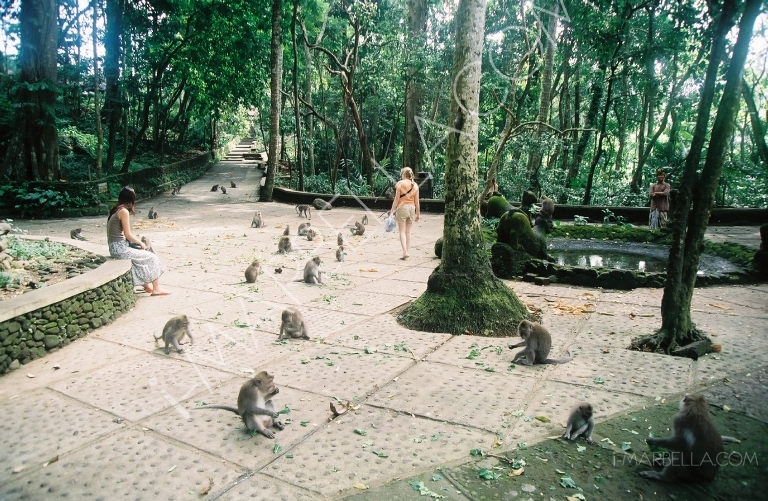 Near Ketut also lies the infamous Monkey Forest, that was also in the movie and is definately a place to see! You can feed the monkeys and watch them up close. For young people there are also very good shops and clubs to visit, also a variety of restaurants and cafeterias. My vacation in Bali was quite active, I drove around the Bali island, spent time in different villages and also visitied the Gili Islands!" super nice, i want to go to Bali! Thanks for tips!